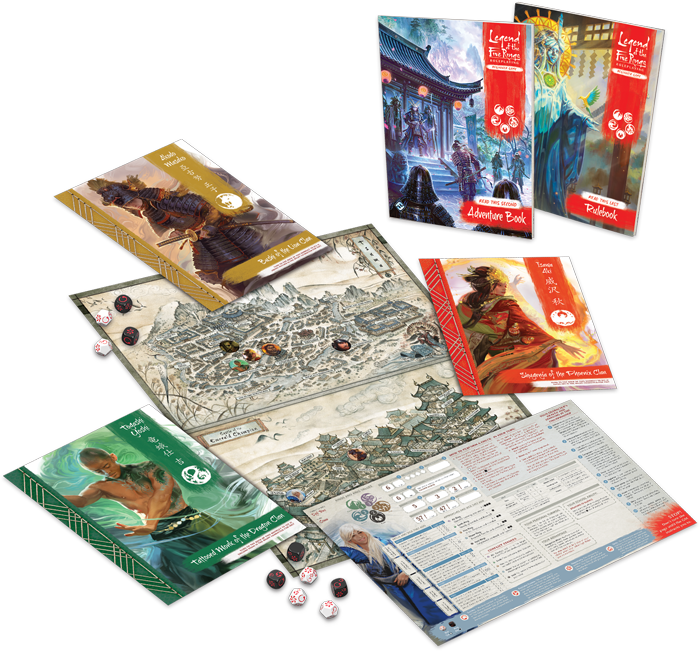 A world of adventure awaits with the Legend of the Five Rings Roleplaying Beginner Game! Last week, we examined your first session of Legend of the Five Rings Roleplaying from the perspective of the player characters, and today, we’re looking at how the Beginner Game makes it easy for you to handle a session in the shoes of the Game Master. Choosing to take on the role of the Game Master can be intimidating. After all, you're not only responsible for keeping the story moving, but engrossing players in the world. You’ll have to keep track of rules in one hand, while constantly presenting players with exciting new challenges and balancing the story on the other hand! While this may seem like a big job, the Legend of the Five Rings Roleplaying Beginner Game gives you all the tools you need to run a successful game. Join us today as we examine how the Adventure Book can guide you through the challenges of your first adventure in the world of Legend of the Five Rings Roleplaying. As with our preview from last week, this article features light spoilers for "The Topaz Championship" adventure. 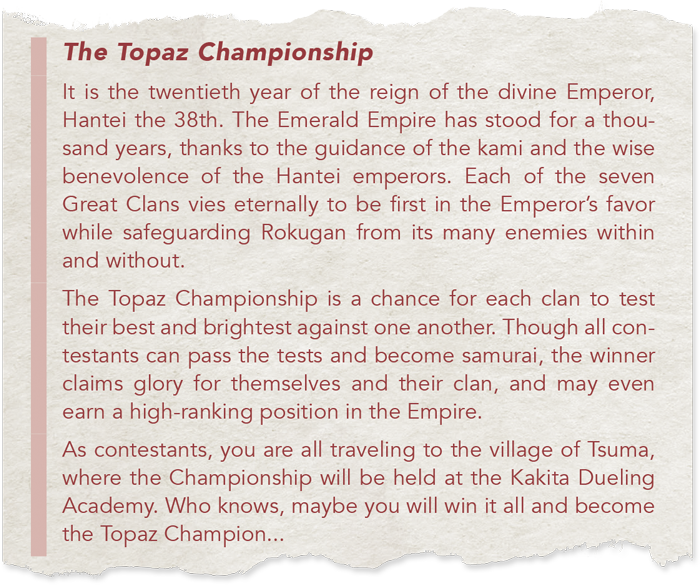 As the Game Master, your role starts before the session even begins—it’s recommended that you read through all of "The Topaz Championship" before you run it. After all, understanding the direction of the story gives you context during your sessions, and it can help you identify any tricky rules that you feel might need a bit of explanation for your players, helping the Topaz Championship run as smooth as possible. Once you sit down at the table with one to four of your friends, the adventure begins—for all of you! You should plan to keep the provided Adventure Book close at hand, as it always offers guidance and even provides mini-scripts to read to players, helping to set the scene and immerse your players in the world of Rokugan. 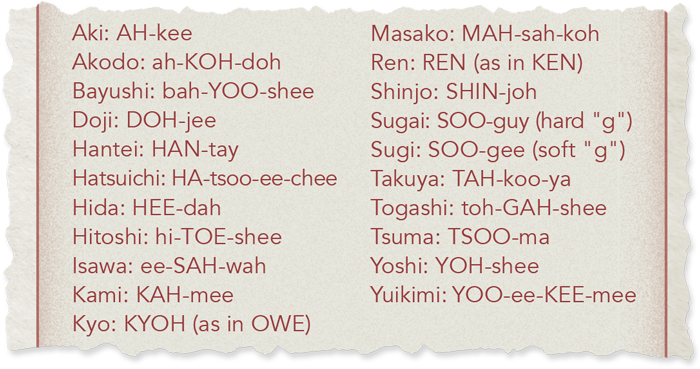 It even includes a handy pronunciation guide. You’ll find the Adventure Book is your constant sidekick in your role as a Game Master, providing the answers you’re looking for and supporting your efforts throughout the adventure. It starts as soon as the players’ first encounter begins, as they come across a peasant with an overturned cart. The players are, of course, free to ask the peasant any questions they can think of or take any action they would like to get around the cart. While this may seem daunting for you to handle as a Game Master, the Adventure Book covers many of the actions and questions that they players are likely to try, providing you with answers to give the samurai as the peasant, and mechanical consequences of the various ways that they can get around the cart. Of course, your players may try something completely unexepected, but you can simply do your best to adapt. This freedom of choice is essential to roleplaying games! The Adventure Book provides you with answers to any questions your players may have! The Beginner Game is certain to introduce concepts slowly as you play, not only helping players learn the game, but helping you to get a handle on the basics of becoming a Game Master before dealing with the more advanced concepts. For this first encounter, there aren't even any skill checks for you to worry about, allowing you and your players to get your bearings in the Emerald Empire. After this encounter with the peasant, your players find their way to the House of the Laughing Carp, which will be their home for the duration of the Topaz Championship. Here, the characters run into a young samurai named Hitoshi in a heated argument with the peasant innkeeper, who is in the process of informing him there are no vacancies at the House of the Laughing Carp. This situation is on the edge. Hitoshi is on the cusp of an unacceptable outburst, one that could cost him considerably in terms of both honor and social standing. Being dismissed by a peasant is an insult to that same honor, though, and being forced to sleep rough in the town of Tsuma will not help his chances in the contest. If your players cannot defuse the situation, they could be caught in the fallout of whatever happens next. On the other hand, this could also be an opportunity to hurt a rival’s chances of winning the tournament, if they just push the samurai one step closer to the edge. This gives players their first major decision to make, but whatever they choose, it is time for your first skill check together. 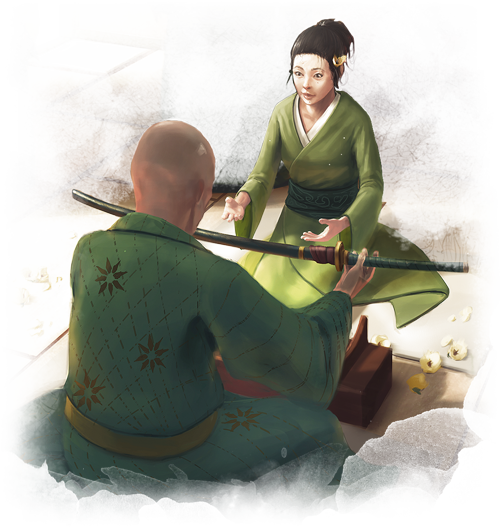 Skill checks are the backbone of Legend of the Five Rings Roleplaying. When the player characters face some kind of challenge, you, as the Game Master, will call for a skill check, which sees your players rolling the custom dice that come included with the Beginner Game. A check can result in a mix of results: success ( ), explosive success ( ), opportunity ( ), and strife ( ). For this first check, strife and opportunity can be ignored, and your players only have to focus on succeeding at the task at hand. While skill checks are a very mechanical part of the game, the Adventure Book offers you a full page of helpful reminders on how to handle them, meaning you can keep the game moving while answering any mechanical questions from the players. Performing a skill check means that you and the player must work together to determine what approach the player is using, and you must determine a Target Number. The approach for each skill check is based in one of the five elements and determined by how the player is trying to make their check. 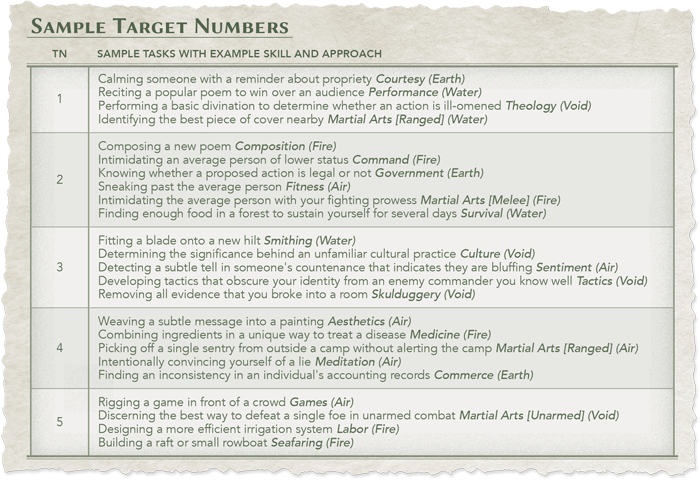 The Target Number, on the other hand, is essentially the difficulty of the task, indicating how many successes the player needs to roll. Determining these numbers may seem tricky, but the Adventure Book provides a lot of guidance on how to determine these numbers. In fact, there is a full page dedicated to the possible responses of your player characters and what they mean mechanically. While you may be a new Game Master, the guides present in the Adventure Book will make you look like a seasoned pro to your players, as you effortlessly determine Target Numbers and approaches. Like the peasant encounter above, just because a solution isn't in the book doesn’t mean that your players can’t try it! If they suggest a course of action not covered in the Adventure Book, you can simply look at the table of sample Target Numbers on the back of the book to determine the difficulty of a task. A chart of sample Target Numbers will help you determine how difficult a task should be! However the situation shakes out, the Topaz Championship is just beginning, and the young samurai are in for the adventure of their lives. If you are looking for additional advice, the back of the Adventure Book features a whole section dedicated to some of the trickier elements of becoming a Game Master, and a rulebook included in the Beginner Game can offer more mechanical insight. Even if you’re new to Rokugan or Game Mastering in general, the Legend of the Five Rings Roleplaying Beginner Game gives you all the tools you need to succeed. The world of Rokugan is yours to explore. Once you and your players have completed the Topaz Championship, more adventures await! Look for a free follow-up adventure on the Fantasy Flight Games website once the Beginner Game is released, as well as three more downloadable character folios. A rulebook included with the game should give you all the information you need to successfully continue your story. But if your group still wants more, look for the Legend of the Five Rings Roleplaying Core Rulebook, coming this fall! 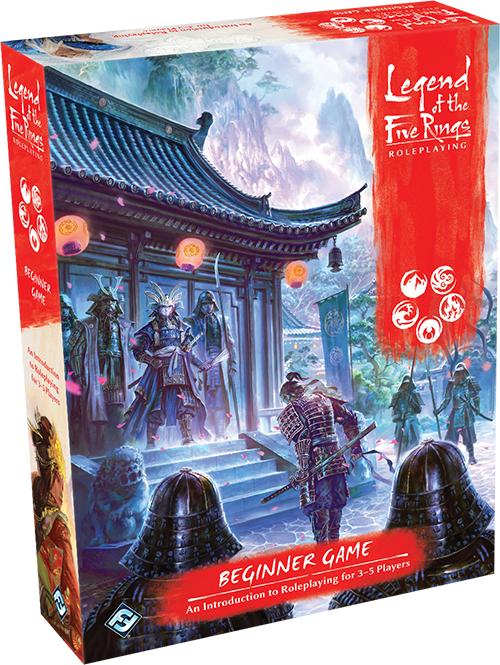 Lead your players into Rokugan with the Legend of the Five Rings Roleplaying Beginner Game (L5R01), available now for pre-order from your local retailer or our website!